Spend a week studying at Oxford England this summer! The magnificent Oxford University quad. 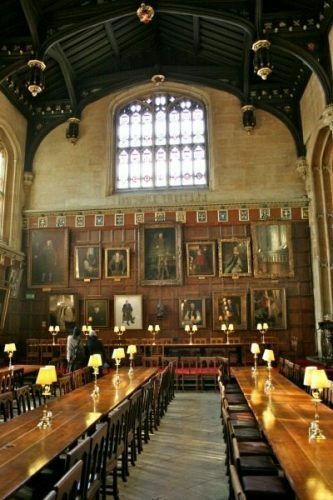 If you’ve ever wanted to eat in the Hogwarts Great Hall, here’s your chance. Well, not exactly, but if you sign up for The Oxford Experience, you’ll eat all your meals in the hall after which it was modeled. You’ll also take classes with esteemed British professors, have tea breaks with people from all over the world, and play croquet in the Masters’ Garden. 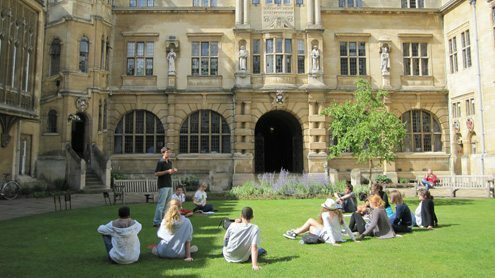 This is The Oxford Experience: a summer program in Oxford, England, where students can spend up to six weeks taking classes, going on excursions and exploring life at Christ Church, one of the colleges of Oxford University. There are 60 courses offered, ranging from Life on the Home Front 1914-1918, Oxford Criminality in Fact and Fiction, and Napoleon: Britain’s Most Dangerous Enemy. Students take one course each week. There are no papers or exams to worry about; the focus is on learning and the unique experience of international learning. Each course consists of 12 students and a tutor. Students come from all over the world and range in age from 18 to 90. Most students attend for one week of the course, though it is possible – though expensive! – to go for all six. The program is in its 25th year, and each year satisfied students are returning for another week of education and culture. Dining Hall at Christ Church Oxford. A typical day at The Oxford Experience begins with a full English breakfast – bacon, sausages, eggs, tea, coffee, and other side dishes. After breakfast, students gather in the classroom for their course, which is taught by an accomplished tutor and has a very informal setting. Depending on the course, tutors might show slides or other relevant material. 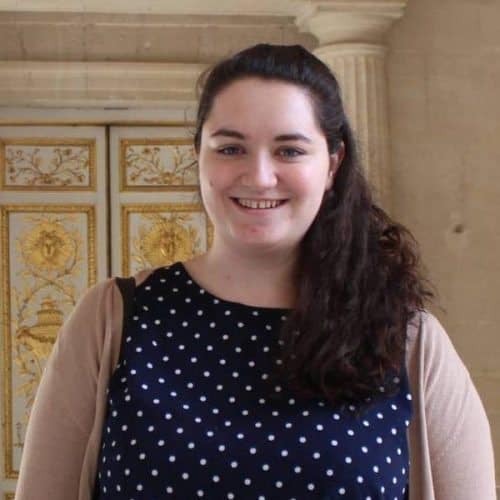 The tutors are known for being very friendly and easy to talk to, according to Barbara Gillam, who has visited Oxford for six summers in a row. "I never had a tutor who wasn't incredibly prepared and ready for every single class," said Anthony Pucciarelli, who has gone to Oxford for three weeks every year since 2000. He teaches English literature to high schoolers and sees the experience as a cross between a holiday and a professional development seminar. "Every year I get the info that I can take back to my students," he said. Of the 60 courses total that are offered, an average of 10 are offered each week. Since courses are generally limited to 12 students a class, simple math says that there are about 120 students in each week. That’s a good number – big enough to find people you can become friends with, but not so large that you won’t recognize anyone at breakfast. Many students go to the program alone, returning year after year to the same smiling faces and many new ones. "I travel alone and as soon as I get to the High Street at Oxford, I'm not alone anymore," said Pucciarelli of the lifelong friends he's made through the experience. "I have wonderful friends from all over the world." After a ninety-minute class session, the courses break for tea. After another ninety minutes of class, courses are finished for the day. Students enjoy a lunch buffet, and afterward, they’ll set off on course excursions with their tutor or other tours that have been organized for the day. A sit-down dinner is served, and students are free for the evening to enjoy more organized activities like a lecture, a pub walk, or playing croquet in the garden. They might attend a concert or visit one of the dozens of pubs in the area. “It’s about enjoying yourself and learning something new,” Gillam said. Morris Dancers in Oxford England. That’s part of the reason there are no papers to write. In a weeklong course, it’s more important for students to absorb as much information and culture as they can and not be bogged down by writing essays. "You can't imagine how comprehensive the classes are even though they're only five days," said Pucciarelli. One of the perks of this experience is that you don’t need to be a special scholar or follow a specific school program to attend; anyone with an interest in the course is welcome and eligible to apply. It’s one of the best parts about the program, said Gillam, because there is such a wide diversity of students. The one thing they’re all certain to have in common is an interest in Oxford and English history in general. 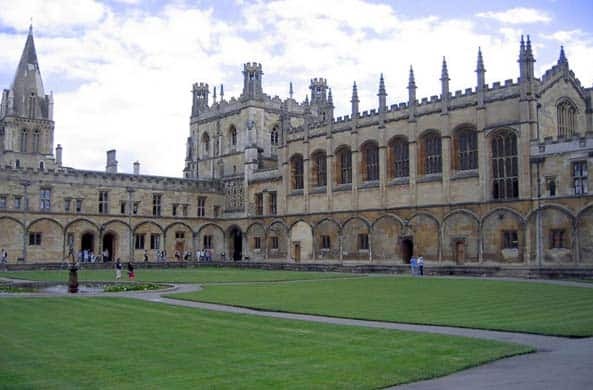 Christ Church is a college within Oxford University, which was founded in 1525 by Thomas Wolsey, the Lord Chancellor of England. It is the alma mater of 13 British prime ministers, Albert Einstein, and the writer Lewis Carroll, among many others. 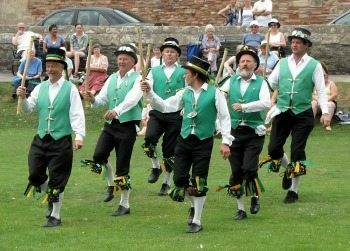 One of the organized activities during the week is the performance of the traditional Morris dancers. This is a rhythmic stepping dance done by dancers wearing bell pads on their legs and often wielding sticks and swords. It’s just one of the many ways that students are exposed to English culture during their study week. Students reside in a variety of residences. Some are modern with private bathrooms (for an extra cost), or some are one or two centuries old, with the closest bathroom up or down a flight of stairs. It’s all part of the authentic experience of being an Oxford University student. Sometimes people who visit England with other Americans can find the sense of culture lacking, but The Oxford Experience seeks to provide an experience where students leave saying “It was my best vacation ever.” And for 25 years, many students have. On the final night of the course, students are treated to a gala dinner in the great hall. It’s a big celebratory dinner, where the wine is flowing and people are enjoying their remaining time with the friends they’ve made that week. Each tutor stands up and everyone in their course cheers as loud as possible for the tutor they’ve learned from all week. At the conclusion of the program, students are given a certificate that shows they studied at Christ Church of Oxford University, a great souvenir and reminder of their week at one of the most prestigious colleges in the world. A week at Christ Church costs $1,907, which includes accommodations, tuition, all meals, and all evening entertainment. Extra costs can come in the form of excursions and sightseeing done on your own. "It's a privilege to be able to stay at Christ Church," said Pucciarelli. Visit The Oxford Experience website for more information. Travel from London to Oxford with the freedom to explore with a rental car from Enterprise! Find cars and get 10% off on car rentals in England.